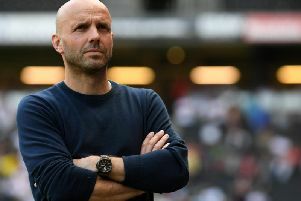 Paul Tisdale is not getting too carried away after MK Dons makde it three wins in row in League 2, beating Cambridge 1-0 on Saturday. Chuks Aneke's 50th career goal was enough to separate the sides, but it was a backs-to-the-wall second period as the U's piled forwards in a bid for an equaliser. Ade Azeez should have scored with a first half header, while David Amoo saw one effort cleared off the line by Jordan Houghton before firing just wide of Lee Nicholls post. The Dons keeper was also required to deny Liam O'Neil in stoppage time as Dons secured their third win and clean sheet in succession. "There's a long way to go yet, but in this world, it can become three losses," said manager Tisdale. "There's a lot of risk management, and you have to be a slight pessimist too, so I'm not going to get too carried away yet. "It was a really tough second half but I'm delighted with the way we played. We've had a couple of close ones previously this season, conceding late goals but today there didn't seem to be any sign that that would happen. "The defenders were resolute, a real sense of discipline and focus in and around the box. I would have loved a second goal in front of our great travelling support, they made it a great day for us. "We're beginning to gain confidence and belief. We had a really good defence in front of Lee Nicholls today, and a defence very determined to block the ball and make things quite predictable for him." Aneke's 50th career strike, coming after 29 minutes, came after a low-key opening period, but the game sparked into life when the striker was booked for a foul on Greg Taylor nine minutes earlier, culminating in his goal and Azeez's sitter just after the half hour mark. Tisdale continued: "In the first 20 minutes, everything was a bit low key, it felt an odd-day. It was windy and we couldn't really hear each other. But there were a few things which sparked everything off. None of us were pleased with his booking – Jordan Houghton committed a foul five minutes later which should have been a booking which wasn't, but it is what it is. It certainly sparked the whole team up. Suddenly there was an energy, Chuks did his bit and it was a very nice finish. "It was from their set piece, and Ryan Watson cleared it. Chuks is incredibly strong and rolled his man. "Playing in conditions like these, with a strong wind against you, you need to go and get the second, you can't just sit there. We've done that a few times this year, but if you give the ball away, the ball comes back very quickly. We did extremely well one-on-one to stifle their attacks. Jordan Moore-Taylor gave a masterclass once again in defending in and around his own box."